This is my first time to post about my ramen experienced but not the first time to eat ramen. Not sure also why ramen became one of the popular dish in our country nowadays, maybe because people from japan has been part of our country way back many years ago and some of our hardworking Filipino workers and tourist from japan promoted ramen in our country how yummy ramen is. I’m not familiar with the ingredients of ramen, every time I ordered ramen I just asked the staff of the restaurant what is the best seller or sometimes if I’m with my friends and colleagues I asked them what kind of ramen to eat or I will imitate what they've ordered. Now that Ramen Daisho invited me to do a food review and meet the team that established this restaurant. I was very much excited and very happy that time. 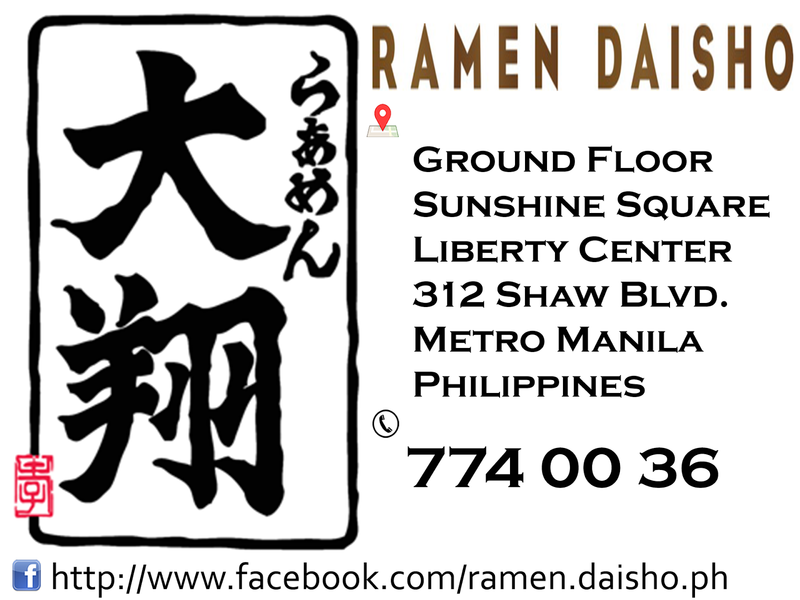 Ramen Daisho was started here in Manila last year 2014 and as per the whole team, they choose Philippines to become the home of Ramen Daisho because we Filipino are food lover and loved to eat and try different kind of food all over the world. One of the risk that they are thinking before they build Ramen Daisho is if people will really patronize their restaurant even though the place was not crowded in that area compare in Mall or in Market, but Ramen Daisho was a blast and they have many customer not only new but some are regular customer that Ramen Daisho was became part of their everyday life. 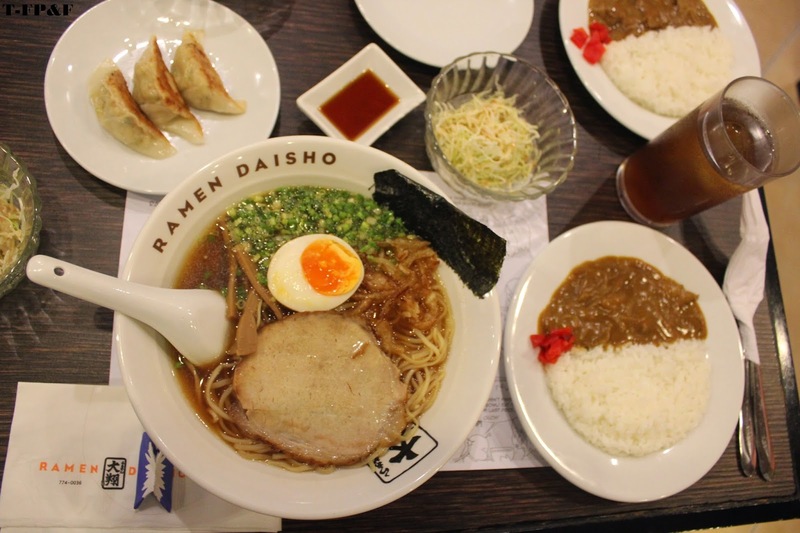 But to give other things about Ramen Daisho, you can check the video of the owner talking about Ramen Daisho. What I have that night is a set for Lunch that cause only 420 pesos. For that set of meal, I have one of their best seller ramen which is Tonkotsu, the soup was so creamy and i really like it from all the ingredients they put including the egg, meat and off course their authentic noodle made from Japan, their noodle was not made or created here in the Philippines, to make sure that their customer really tasted the authentic ramen thy import their noodles from Japan, they have three kinds of noodles with different characteristics, thin flat noodles feel smooth and silky on the palate, which the texture of the curly noodles is chewy. Also available are the thin straight noodles, served specially for their hakata variety. They use noodles that perfectly match the soup for your perfect ramen experience. How about the other dishes included in my lunch meal? Chahan was also good, it was like a fried rice with sauce and some meat and I also like it, the next one is their side salad that gave me a sweet and sour taste because of the dressings together with its cabbage that compliments to each other, and their Gyoza which is the best Gyoza I've ever tasted that I will probably ordered the next time I visit Ramen Daisho, Gyoza was cooked well and the meat and condiments they put in Gyoza was tasted good also. Beside from our lunch set, they also gave us a chance to try their California Maki, gelato ice cream and chicken karage. Before ramen, the only Japanese food that I was able to try is California Maki that became my favorite also, and yes Ramen Daisho California Maki was really good, for the gelato ice cream, we've tried the different flavor and what I really like the most is their green tea macha, salted caramel and soursop (guyabano) and take note that their gelato are all Japanese style gelato. Chicken Karaage I like the way it was prepared and if you put dressings. I've already listed all the dishes that I have tasted but what about the drink? Their drink called Japanese iced tea, that was also my first time to try Ramen Daisho iced tea and it was very different from the iced tea that we know and at first taste, I don’t really like it but when I was able to drink it again and again and there is no other drink and I don't have a choice (just kidding) but yes I used to love the taste and it was like a cold rice wine that we have here in the Philippines in the north part of our country. For the place, if you will check their dining area, it can accommodate almost sixty guest including the room that can be used for team meeting. Their kitchen area is half visible that you can see how the cook and staff are happy preparing your dishes. The restaurant ambiance was very relaxing and the staff will guide you and help you choose what kind of ramen you could probably order and that will satisfy your cravings. The whole team of Ramen Daisho was very nice and very accommodating, most of the staff are Filipino and they used to adopt Japanese culture because of their work environment. I may not understand Japanese language but their gesture will let you feel and understand what they want to tell you and how they are happy here with Ramen Daisho.